Czech food taste a lot like Italian. Maybe because it’s really Italian. Pillow-y gnocchi from Corso Cafe. 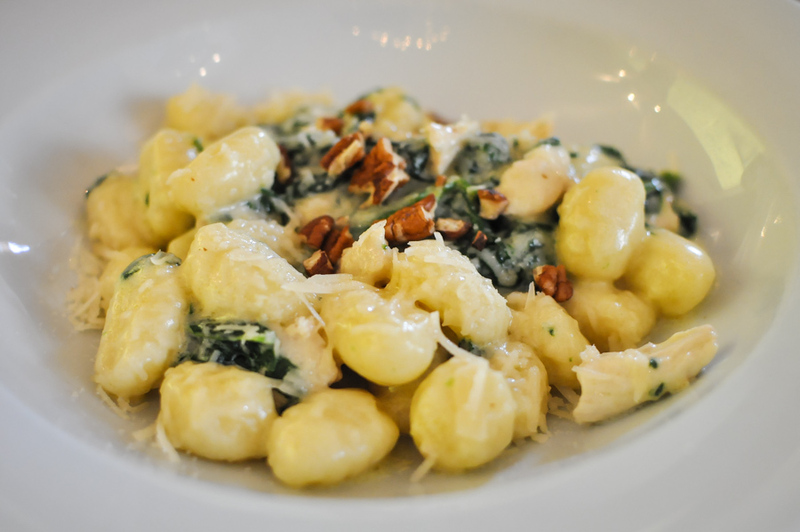 Itty-bitty, fluffy pillows of gnocchi that simply melts in your mouth. These were tossed in a light gorgonzola with chicken and spinach topped with crunchy walnuts. Tagliatelle and walnuts at Ambiente. I mean this when I say, this is my all time favorite Italian dish! Tagliatelle is my new favorite pasta. 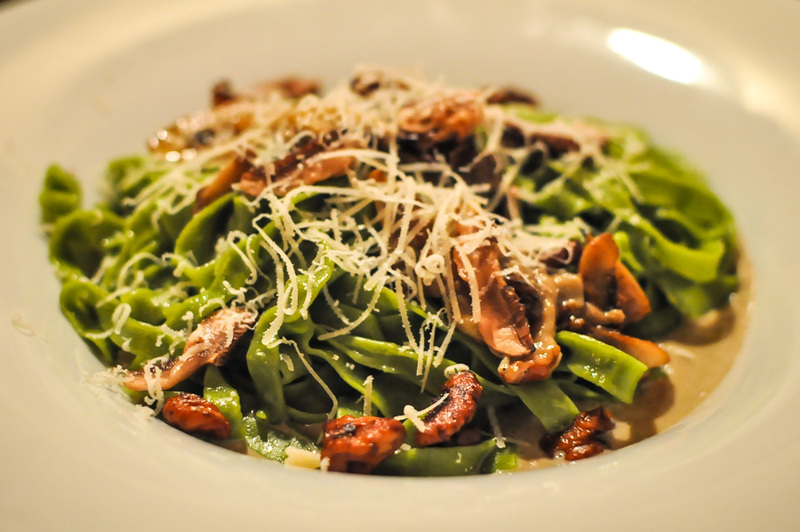 And tagliatelle tossed with sauteed mushrooms and candied walnuts.. forget about it. I didn’t even want to share this with Gerard, it was that good. Prosciutto pizza at K Motra. You can’t go wrong with prosciutto on pizza. At K Motra, it’s all in the crust. 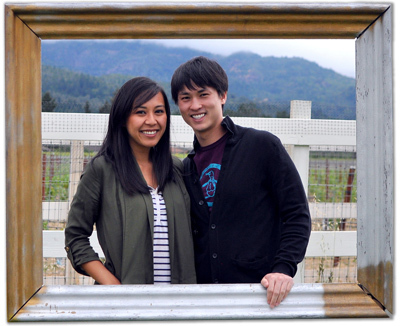 The great value and setting in an underground cellar makes it an easy pick. Spaghetti with fresh tomatoes from Oliva. Anytime you can have Italian and walk away feeling great, not the usual heavy- bloated feel, it’s a winner. 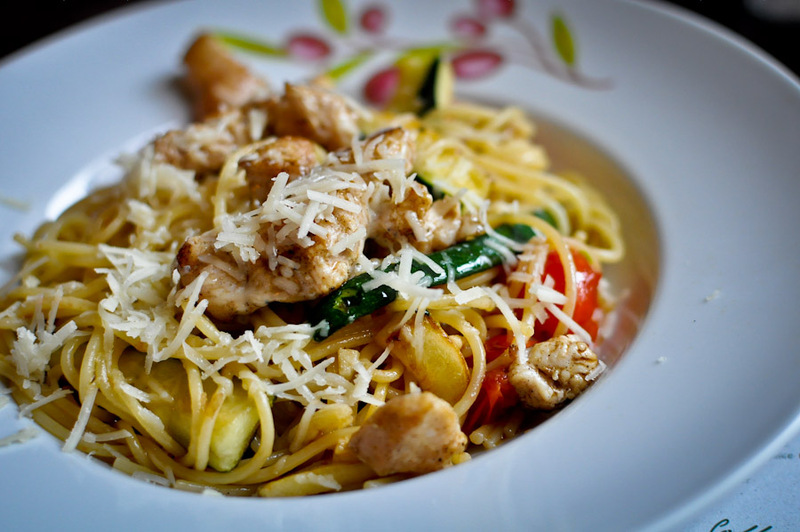 This is Gerard’s favorite dish from our Italian jaunt in Prague – spaghetti with chicken tossed with fresh tomatoes and veggies. It’s so refreshing to not have spaghetti drenched in meat sauce. And those are just a handful of the delicious Italian foods we ate while in Prague. Outside of Italy, where have you had great Italian food? That Tagliatelle looks amazing! Candied walnuts… what! Oh, you’re in trouble! Where’s the warning label on this post? I’m starving now. I need some of that gnocchi STAT. Me too! Sadly, I haven’t been able to find the perfect gnocchi here. So so sad. Oh wow, I want that tagliatelle! Amazing amazing amazing! Or, what if Italian food is really Czech food! Did you ever think of that? Seriously though, we never ate Italian food when back home because it seemed so boring and like stuff we could get at home. Now I am starting to drool at the thought of pizza and non-rice based pasta. Those gnochi look like little clouds from heaven! 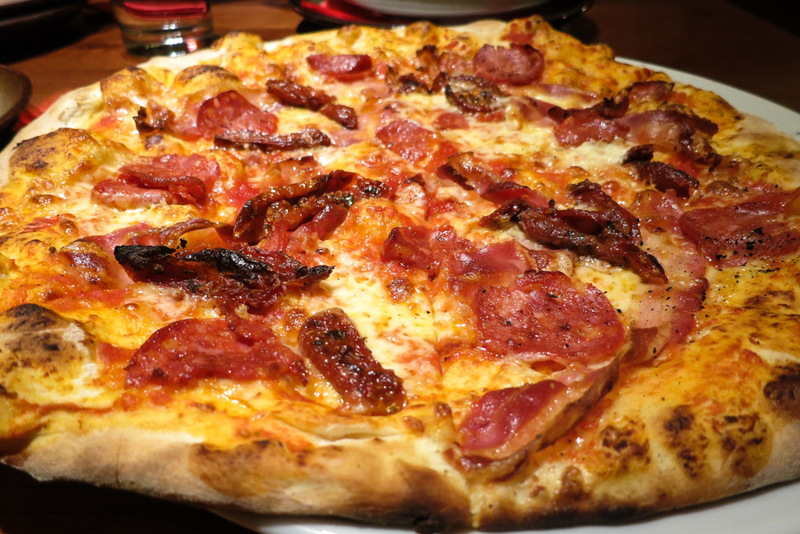 You have my mouth watering for Italian and Prague now….missed most of those places but did have the best wood fired pizza in a little Italian gem in Prague. Have to dig up the name of the restaurant, but OMG good!!! Believe it or not, I had one of the best Italian food in Ethiopia (the used to be under Italy occupation). Or maybe it was because I was tired of eating injeras all the time? Outside of Italy, I had lovely Italian in Qatar last week! Believe it or not.. admitedly, at the Four Seasons hotel. But had some memorable italian meals in Portugal, Spain, UK and USA. Yum! I don’t think the Four Seasons can go wrong.. but in Qatar.. wow. That’s pretty awesome. Eating wonderful Italian in Prague is an experience I hope to soon Czech off my food bucket list. Thanks for the tip. YUM!!! This looks amazing! I love the idea of walnuts with pasta. I usually tend to stick to a country’s traditional food while traveling, and stay away from Italian, simply because I was raised on Italian food, since it’s where my grandmother was born (not that I look Italian AT ALL). That being said, we got Italian at Good Morning, Vietnam in Nha Trang, and while the pasta I ordered wasn’t all that great, the pizza was the best I’ve had outside NYC or Italy/Croatia. I still think about! Wow…you weren’t kidding. That’s some good looking Italian! Se ven muy apececibles las recetas que nos mostráis.